Horror experts and writers Joseph Nassisse and Del Howison have collected outstanding original horror short stories in a dazzling variety of styles for MIDIAN UNMADE. 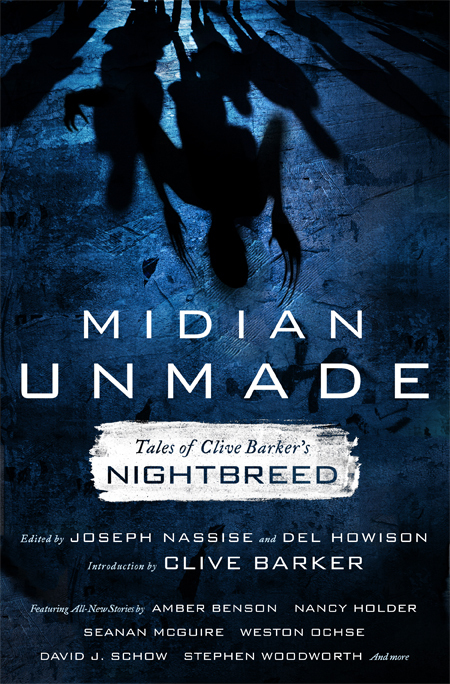 Publishers Weekly recommends the stories, and praises, “the juxtapositions of monstrous humans and humanized monsters will register with fans of thought-provoking horror.” With an introduction by Clive Barker himself, MIDIAN UNMADE is a collection for any horror fan to enjoy. Contributors include: Karl Alexander, author of the classic novel Time After Time; actor, writer, and director Amber Benson (Tara Maclay on Buffy the Vampire Slayer); New York Times bestselling author Nancy Holder; Hugo and John W. Campbell Award winner Seanan McGuire; Bram Stoker Award winner Weston Ochse; David J. Schow, winner of the World Fantasy Award and writer of the screenplay for The Crow; New York Times bestselling writer Stephen Woodworth; and many more—the collection contains 23 stories in all. MIDIAN UNMADE tells the stories of the Nightbreed after the fall of their city, Midian. Driven from their homes, their friends and family members slain before their eyes, the monsters become a mostly-hidden diaspora. Some are hunted; others, hunters. Some seek refuge. Others want revenge. MIDIAN UNMADE is the horror collection of the summer – essential reading for anyone who enjoys outstanding, heartfelt horror. JOSEPH NASSISE is the author of the Templar Chronicles and the Jeremiah Hunt novels. He has been a finalist for the Bram Stoker Award and the International Horror Guild Award. He lives in Arizona with his family. DEL HOWISON is the co-founder and owner of Dark Delicacies, an independent horror bookstore, in Burbank, CA. Howison has co-edited several collections, including the Bram Stoker Award-winning Dark Delicacies: Original Tales of Terror and the Macabre. Others' take on the Nightbreed world? Could be cool.